Northport Village Hall is located at 224 Main Street, Northport, NY 11768; phone: 631-261-7502. Photo: Main Street, Northport NY, ca. 2008. Photographed by User:Fife Club (own work), 2008, [cc-by-3.0 (creativecommons.org/licenses/by/3.0)], via Wikimedia Commons, accessed September, 2015. 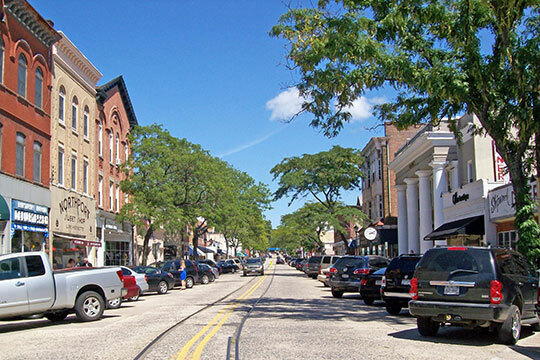 The Northport community traces its roots to a purchase of land in 1656 by three English settlers from Huntington. Chief Asharoken and eight braves of the Matinnecock tribe sold a tract to the settlers extending east from Northport Harbor to Smithtown Harbor, south to the present Jericho Turnpike, and north to Long Island Sound. Early settlers coexisted peacefully with the Indians as they cleared land for farms and cut trees for buildings using the Indian's path to the harbor where they fished and followed their hunting trails through the woods. An isolated farming and fishing lifestyle continued for about one hundred years until the Revolutionary War. After the war, the area began to grow with sailing packets stopping at the harbor to pick up cordwood local farmers had cut in exchange for fertilizer that came from New York City horses. With the increase of coastal maritime trade, a dock was built in 1802 to facilitate the loading and unloading of cargo. By the middle of the nineteenth century, the village was a bustling, active place with sixty-five homes and fifty businesses. Its deep harbor location encouraged the growth of shipbuilding, oystering, and clamming industries. Entering the twentieth century, Northport was in the forefront: an incorporated village (1894) with electric lights, a newspaper, prosperous businesses on Main Street, ferry service to New York City, a Long Island Rail Road station, trolley service, and a library. By 1920, the village had a population of about 2,500. John Auwaerter, Program Analyst, New York State Office of Parks, Recreation and Historic Preservation, Northport Public Library, Suffolk County, NY, nomination document, 1996, National Park Service, National Register of Historic Places, Washington, D.C.